As requested, both lords and ladies get index finger rings and little finger rings. Like before, the rings are for YA/adult to elder and come in gold and silver, for both hands. (I’m lazy, so you only get pictures of the left hand here, but the right-hand ones are in evidence in the title pic.) Note that the silver rings actually are a little lighter than they are in the pictures; I decided to go with a different silver envcube for the shiny, but of course I didn’t think of it until after I’d taken the screenshots. While both variations have custom icons in CAS and when you change your Sims’ appearance, for some reason they won’t show up for when buying from a jewellery stand – then you’ll get the infuriatingly non-descript bald head of accessories instead. I don’t know how to get around this, sorry. This entry was posted on 1 February, 2014 at 19:10	and is filed under Accessories, BODY SHOP, Bodyshop, DOWNLOADS, Medieval-ish, THEMES. You can follow any responses to this entry through the RSS 2.0 feed. You can leave a response, or trackback from your own site. Yay more things for me to download and recolor eighteen bazillion times! (Okay, a minimum of seven and possibly as many as nine times.) Thank you so much! It’s ridiculous how much I love new projects. I haven’t bought anything from a BV jewelry stand in so long (sold from, sure) that I had no idea the thumbnails weren’t of hands. Doesn’t that make buying even Maxis rings a tricky proposition? 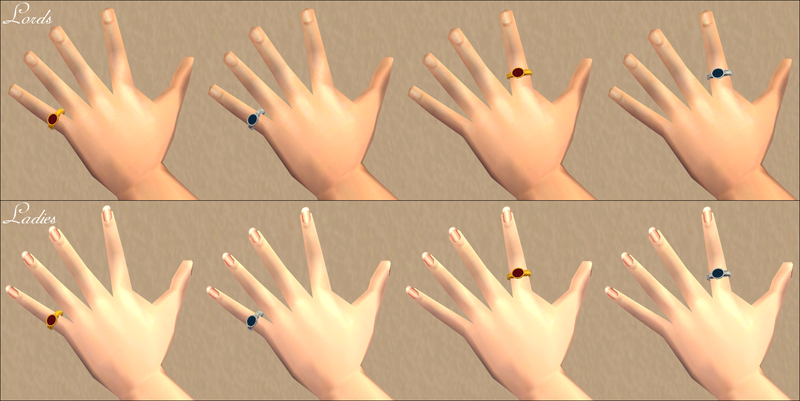 … Especially buying Maxis rings, due to lack of tooltip? I shall indeed have fun with them! So far I know I’m making: Red with a tower and a gold band, red with a stag and a silver band, green with a harp and a silver band, green with a dragon and a gold band, blue with a boar and a silver band, black with a unicorn and I think a gold band (I need to look at my unicorn again), purple with a crowned lion and a silver band, and I’m still working on colors for my churchy heraldry but the device is praying hands under a plumb bob. Oooooh! So many pretties to look forward to! Can’t wait to see them! Your creations are always top-drawer and safe for my game. I really am so excited that you added the rings for index and ‘pinkie’ fingers. I can understand about screen shots, seems like staging a screenshot takes more time than creating. I always appreciate and admire a good presentation. Thanks for all, Johanna!